Pancakes are are simple but delicious dish that makes everyone happy! Though it takes forever to prepare enough pancakes for a pancake-themed dinner party. so…how to solve this issue? 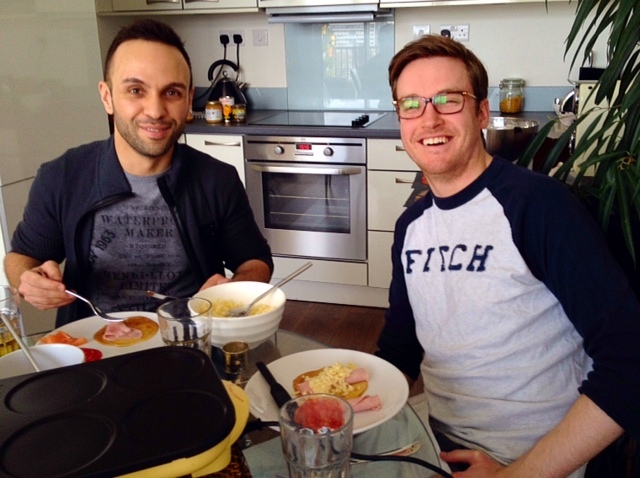 Last weekend I was invited by my very good friends Alex and Ryan for a pancake party. Pancake-day had just recently passed and I thought a pancake party was a great idea, though…cooking enough pancakes for a whole bunch of people? That usually means hours in the kitchen! 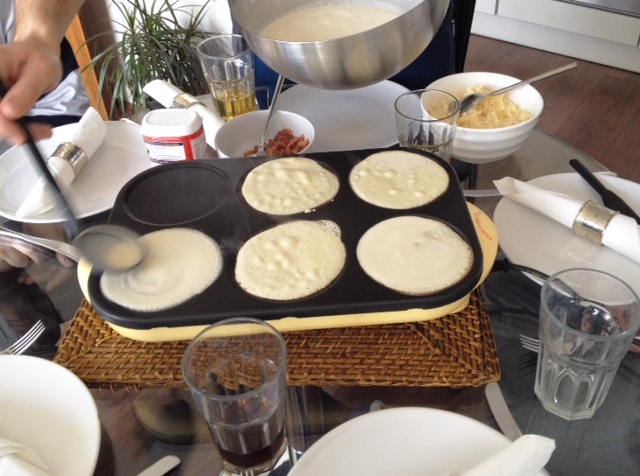 It was when I arrived at their place and they opened the door that I saw the trick: a pancake-maker for multiple guests! What an invention. And it may sounds silly to those of you who have heard of it before or even used it. But for me, that was a complete new thing. I have never seen one in Italy and I would have never imagined it would actually be such a cool item to have in the kitchen. A “pancake-party” maker is simply an electric non-stick plate with 6 circular “cavities” that can cook up to 6 crepes or pancakes at once. When you want to organise a pancake party, all you need to do is to chop and plate some ingredients to fill the pancakes, to place pancake-maker in the middle of the table, pour the pancake-batter (pancake recipe here) in each cavity and…let the guests cook their own pancakes for as long as they want and then fill them with the ingredients they like. It’s really fun to be in charge of your own meal while you are chatting around the table with the other guests. You have a laugh when someone gets distracted and burns a pancake. It’s even funnier when you see the odd combination of ingredients people choose to fill their pancakes; trust me, the experimental-tasting of some people has no limit. Cheeses and hams, salame or salmon is a perfect range of ingredients for the fillings. Extra toppings as fried bacon stripes, fried onions, herbs or chopped vegetables offer an even wider range of choices. 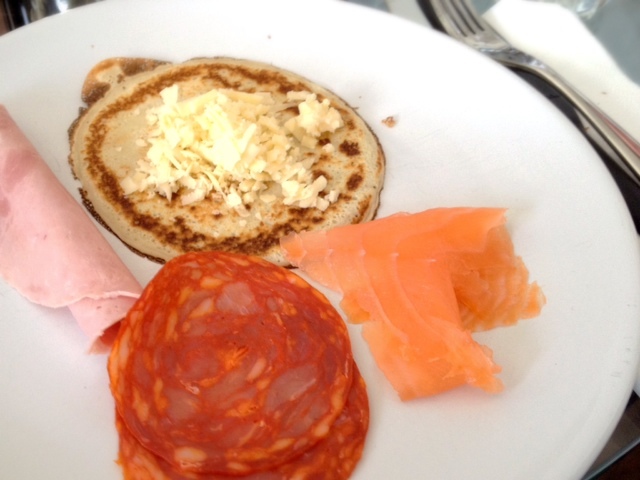 I tried salmon and cream (though the cream is a bit too runny for pancakes), salame and cheese (so nice), ham, cheese and cream (when the cheese melts it mixes with the cream and the result is lovely). 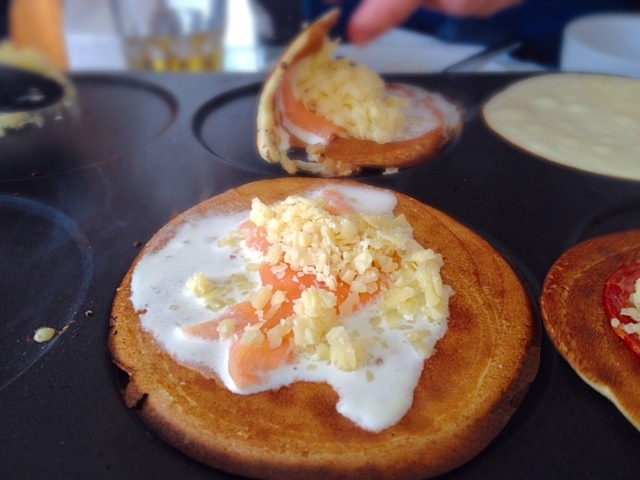 Salmon, cheese and cream: the soft texture of the ingredients is a winner combination. You can add dill or fennel seeds to add some extra flavouring. Though after my 7th savoury pancake (yes, 7… I can really eat a lot if I want), I started decreasing the amount of fillings. After the savoury pancakes, we continued the meal with sweet ones. 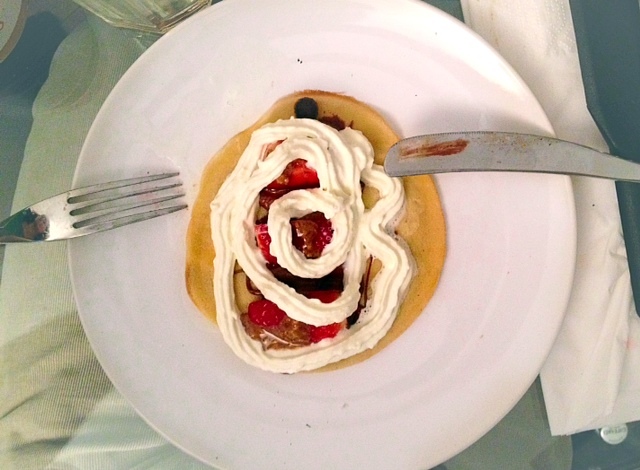 Whipped cream, Nutella, hazelnut butter, fresh berries, jam amd marmelades… it was an EPIC pancake party. Despite trying several combination, I have no doubts: Nutella and whipped cream are still my favourite ones! We spent hours sitting around the table, talking, laughing, drinking, cooking and eating: the time flew and it whas an unforgettably fun party. Thanks Alex and Ryan! On my way home I looked immediately for a pancake-maker to buy for my house. I found an interesting one from Tefal (and not very expensive). There are several other on the markets though, so I’ll do a bit of research before buying mine. I can’t wait to have my first pancake-party at my place! Are you looking for the best pancake-mix recipe? Click here and try my own PANCAKE RECIPE.